FC Halifax Town suffered their first defeat of the season as they lost an entertaining clash 3-2 at AFC Fylde. Fylde and Halifax were two of the top three scorers in the division going into the game, so a high-scoring contest wasn’t much of a surprise. Tom Denton, who scored in home and away wins over Fylde for North Ferriby last season, opened the scoring after half-an-hour, but the hosts immediately struck back through Caspar Hughes. Town had reason to feel hard done by with the manner of Fylde’s second, a Danny Hone own goal, but the Halifax defender then produced the equaliser after 72 minutes. However, Fylde showed the kind of resoluteness that earned them a last-gasp 3-3 draw with Salford in midweek as Bohan Dixon’s shot regained them the lead with 10 minutes left. Fylde finished with 10-men when substitute Matt Blinkhorn was sent-off after an altercation with Hone, but by then, it was too late to have much of an impact on the result. Town boss Billy Heath has said he wouldn’t swap Denton for any other striker in the division, but the division’s top-scorer Danny Rowe would seem an obvious candidate should he wish to. Rowe, who netted 37 goals last season, was striking for goal within the first five minutes, and would have tested Steve Drench but for an excellent block by Kevin Roberts. Scott Garner, who kept Rowe fairly quiet along with Hone, nearly opened the scoring when his shot was deflected inches wide. That was from a Jordan Sinnott long-throw, and from the next one, Matty Kosylo also got an effort in at goal, which was comfortably saved. Rowe had been as much of a spectator as the hundreds of Town fans packed in behind the Fylde goal after that early Roberts block, but tested Drench with a whipped free-kick from nearly 40 yards that was turned behind. By the time Kosylo headed wide from Josh Wilde’s cross midway through the first-half, Town could reflect on a pretty successful 23 minutes, having looked the likelier to score, with Denton the conduit to some attractive build-up play. The breakthrough came when a delightful pass by Sinnott played in Josh Macdonald down the right, and his cut-back found Denton, whose first shot was blocked before his second was rammed home. But the few Town fans who worryingly ran onto the pitch to celebrate barely had time to get back to where they had been standing before Hughes smashed in Fylde’s immediate response, which came barely 30 seconds later, when his low shot beat Drench at his near post from 20 yards in a move that started straight from the kick-off. The action was coming thick and fast now as Denton saw a header ruled out for offside, which preceded more Town fans running onto the pitch in celebration, before Sinnott’s fierce volley was straight at Tony Thompson from just outside the area. There was a lull in chances until moments before the interval when Denton’s looping shot after a goalmouth scramble was cleared off the line by, of all people, Rowe, who had saved as many clear chances as he’d created in the first 45 minutes. 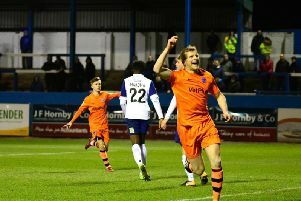 Rowe had a major part in Fylde’s second, just after the restart, when his shot was saved by Drench, but the ball ricocheted off Hone, who scored the winner in the play-off final for Ferriby last season against Fylde, and into the net; how’s that for karma? Denton had seen a header saved by Tony Thompson just before then, but the goal somewhat burst Town’s balloon and left The Shaymen looking rather deflated. Hone tried to make amends with a header straight at Thompson before Denton nodded over after good work by Kosylo, who looked like Town’s best route to goal as the second-half wore on. Denton hit the outside of the post with a scrappy effort under pressure from ex-Halifax defender Steve Williams, but Fylde were now sitting deeper, attacking less frequently, and frustrating the visitors. But Town dug deep and found the equaliser when Macdonald’s excellent low cross was turned in from two yards by Hone; how’s that for karma? Needless to say, the half-time plea over the PA system for the Town fans not to run onto the pitch went unheeded. But the match took another twist when Dixon’s low shot across goal from just inside the area rolled into the far corner beyond Drench. Town had rallied once, and so nearly did so again when Kosylo went through on goal, but Thompson reacted brilliantly to tip his shot onto the post. Fylde: Thompson, Holmes, Kennedy, Langley, Williams, Bond, Hardy, Finley (Collins 87), Rowe, Dixon (Blinkhorn 81), Hughes (Baker 77). Subs not used: Newell, Hughes. Halifax: Drench, Roberts, Garner, Hone, Wilde, Macdonald, Hibbs, Sinnott, Kosylo, Peniket (Burrow 82), Denton. Subs not used: Nicholson, Hughes, Barrows, O’Brien.